God calls each of us in Micah 6:8 to do justice, love kindness and walk humbly. Lutheran World Relief asks us to be their partner in that call by putting our faith in action. 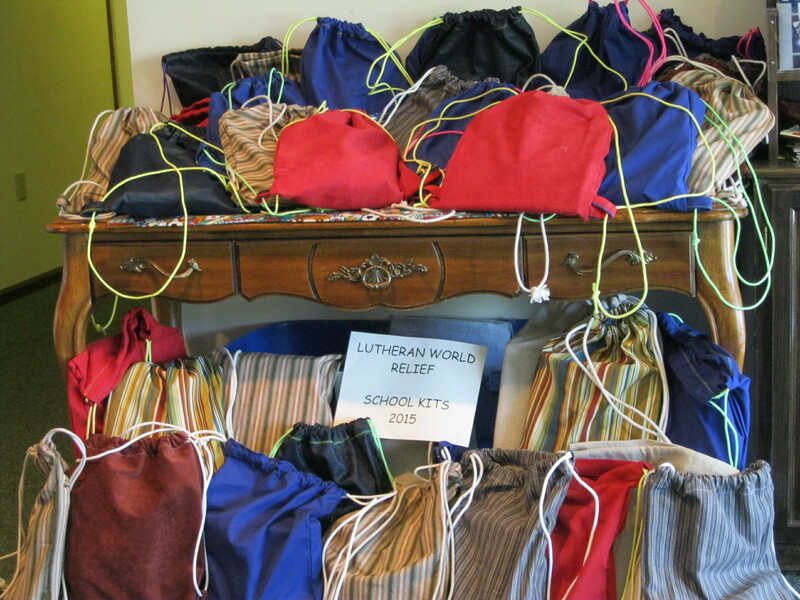 This summer we collected items for Lutheran World Relief Personal Care Kits. These will be shared with people who have lost everything from a natural disaster or life-threatening violence. We were able to ship 28 Kits through the wonderful people at Jerusalem Lutheran in Seville who provide a huge truck to take our donations to a LWR distribution site, which saves us all a great deal of shipping costs. We have been filling backpacks for many years. 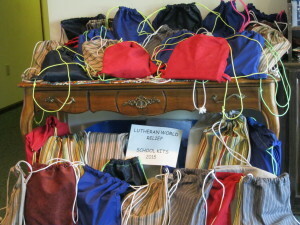 We filled 53 backpacks with new supplies this year that will be sent to Lutheran World Relief’s School Kit project. Why school supplies? To the children who receive School Kits, these supplies mean the difference between getting an education or not. Public school is usually free in the places where LWR works, but even a few required supplies, like pens and paper, may be more than many families can afford. And when parents can only afford to send one of their children to school, girls rarely get priority. . . . . . . . yet the education level of mothers has the biggest impact on the development of their children. A FEW MONTHS AGO WE WERE NOTIFIED THAT OUR BAGS WERE SENT TO HAITI IN 2016. THEY HAVE SUFFERED FROM SEVERE STORMS WHILE STILL TRYING TO REBUILD AFTER THEIR HORRIFIC EARTHQUAKE. 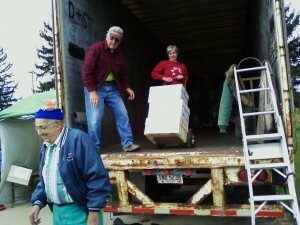 Jerusalem Lutheran Church in Seville has made a donation every year of a tractor trailer to carry all the area churches’ donations to a central location for shipping to LWR destinations. When we take our donations to Seville this month, we are rewarded by seeing the great outpouring of love shown by hundreds of participants. The boxes slowly but surely fill the entire truck and you can see that we are just a small part of the process, but all we do adds up to a great amount of caring. Our 2013 collection was “Personal Care Kits.” We collected a total of 55 kits. When LWR distributes Personal Care Kits, it’s often to people who have lost everything. In the wake of an earthquake, or having fled from violence as their homes were overtaken, they clasp a towel from a faraway place, with a bar of soap, a toothbrush…and while washing up, they know that they have not been forsaken by the world. The very simple gesture of giving a Personal Care Kit can give someone the encouragement to start anew, starting with a bath. You can share God’s grace and love by providing that simple comfort. Each kit includes a bath-size towel, two bars of bath soap, fingernail clippers, a comb and a toothbrush.